Many of you know that I have a love of fountain pens, and use them to write to many pen pals. I found out this week that one of my newest pen pals is celebrating a birthday this week, one day after mine. I decided I wanted to make her a fountain pen themed card and had a fun time sorting through my stamps to come up with this card! I love when I can sift through my large collection of stamps and put various companies together on one card. 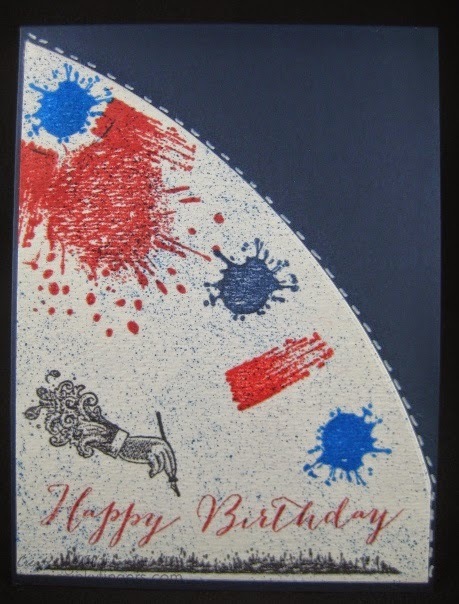 As a lover of fountain pens, I am accustom to random splatters of ink drops, and think it was a fun addition to the card. I love the handwritten look of the sentiment by Scrappy Happiness. I have a new fountain pen on my table today. An early birthday gift to myself! It is a Namiki Falcon that I have been wanting for a while, and hope to use it for some flex writing. It is my first gold-nibbed pen, so it is rather exciting for me. Wishing Emma a very Happy Birthday! Very creative card, Winnie! I always enjoy when I can mix and match various company stamps too. I think the ink splotches are perfect! I'm so lucky!!!! I have it propped up on my test where I can see it while I work on making you one in return! Thank you so much!!!!!!! Congratulations on the Namiki! And happy belated birthday! WOYWW #268 - "Candy Is Dandy, But …"